They’ve been “Fellows” for nearly a year, and more than likely they’ve become Detroit’s friends for life. Last September, AJ Aaron (24), Michael Evers (25), Joel Millman (24), Coco Spencer (22) and Carly Sugar (25) came to the city to live, work and play. Together, they’ve embarked on an adventure, living and working together as the first cohort of Fellows at Repair the World Detroit, a nonprofit community service organization that recruits and matches volunteers — working in partnership with schools, youth programs, urban gardens and neighborhood associations throughout the city. 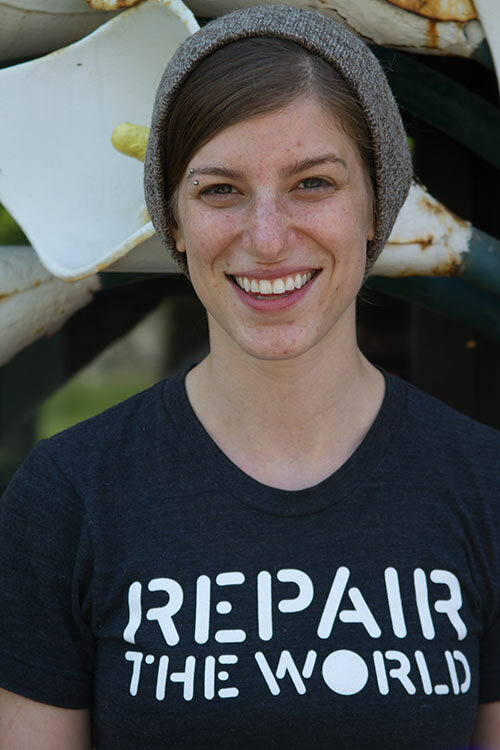 “We envision that The Workshop will be a community asset, serving us well as a neighborhood hub, a home base for programming and events, film screenings and art,” says Nora Feldhusen, Associate Director at Repair the World. “Think of it as a welcome place for people to just hang out and use the internet,” adds Joel. It’s lunchtime. The Fellows have just adjourned from their meeting — seated outdoor camp-style on the lawn across the street. As they casually file in, we settle into conversation. Question: What brought you to Detroit to Repair the World? CARLY: I’m a graduate of Indiana University with a passion for all things food – growing it, cooking it, sharing what I’ve learned about it. I moved back home to Bloomfield Hills after graduating, started volunteering and working in the city – first for Freedom House, a shelter for political refugees; then with a nonprofit called Project Healthy Community, based in the Northwest Activities Center. They do food pantries and a garden I manage. Last summer, I ran into a friend at the Activities Center who told me about Repair, a partner of Project Healthy Community. Here I found the perfect opportunity to further the work I was doing and to network with other nonprofits in the city as well. BEN: As I have observed, the kind of connections that Carly describes are true to just about everyone here. That’s what has made our first cohort of Fellows so productive and exciting to watch in action. The learning curve has been phenomenal, as each has had an opportunity to put their own fingerprints on projects here. 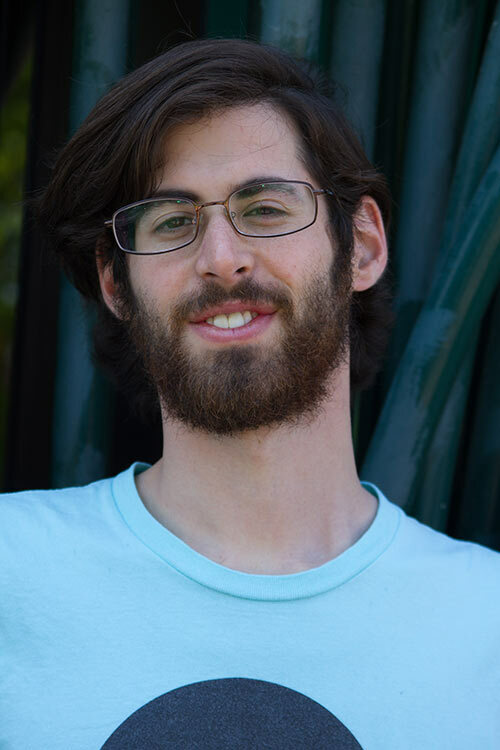 MICHAEL: I first learned about Repair the World a few years ago, while working in New Orleans during an alternative spring break program through Hillel at DePaul University in Chicago. After graduation, I lived in Israel for short while, working on an ecological farm in a town called Modi’in between Jerusalem and Tel Aviv. I was looking for work when and an application from Repair the World popped up in my email box announcing that they were launching this new community volunteer fellowship in Detroit. The prospect lined up with my interest in community building and service opportunities in Detroit. So I applied and here I am. JOEL: I went to Northern Michigan University and majored in having fun. Seriously, I have a degree in economics, but up north I’ve spent a lot of my time downhill skateboarding, cliff jumping and mountain biking. I’m never bored. 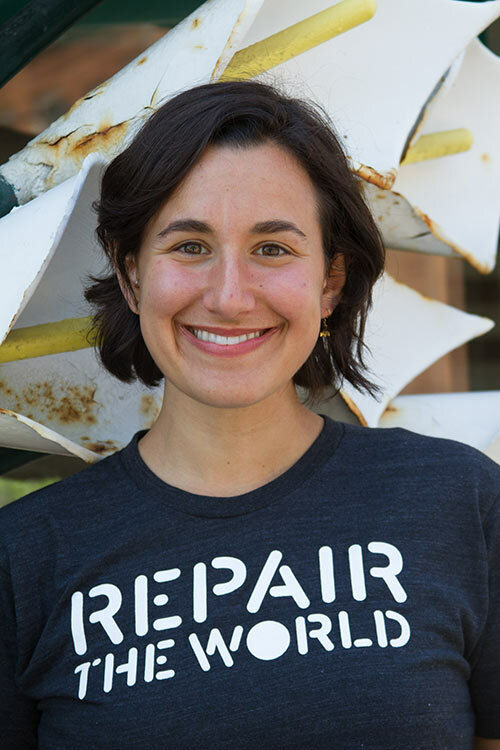 An application from Repair the World also popped into my email box and I thought hey, why not, this would be a great learning experience for me. I enjoy teaching and sports and have lots of fun with the kids. COCO: I’m from Northern California, went to college for five days, dropped out and started working with two of my friends in a community center in San Francisco. I moved to Arizona, volunteered with Conservation Corps, then moved on to a job with Space Camp in Alabama. It wasn’t really a good fit for me, so I moved back to California. As it turns out, when Ben sends an email, word gets around. A friend of mine who knows Ben called me and asked, “Do you want to live in a rectory of a church in Detroit?” She sent me the information about Repair the World, and I called Ben to clarify one small detail: “Hey, Ben, I’m not Jewish. . .” “Well, nobody is perfect,” he answered. And that’s how I came to Michigan. AJ: I was eager to find a meaningful way to move back to my home state after spending the last six years away in college and other programs. I wanted to learn more about my grandparents and parents’ relationship to Detroit, as well as my own. 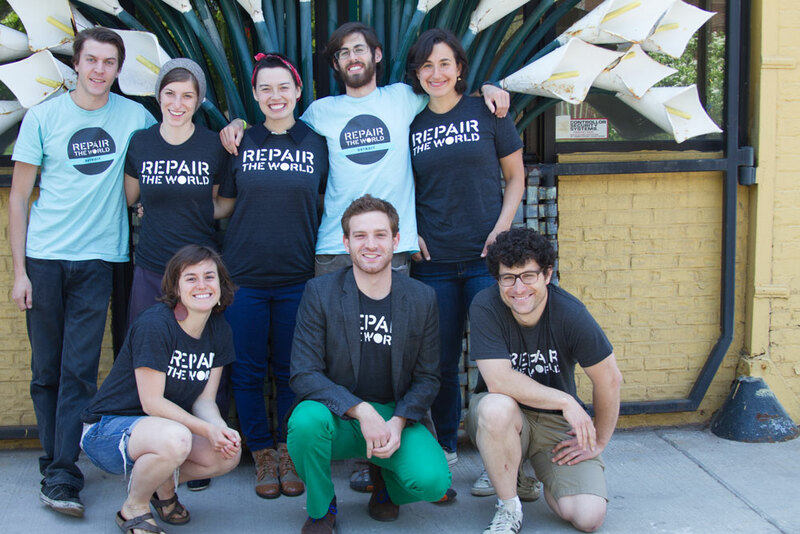 Repair the World offered the opportunity for me to begin that process. What have you learned this year? 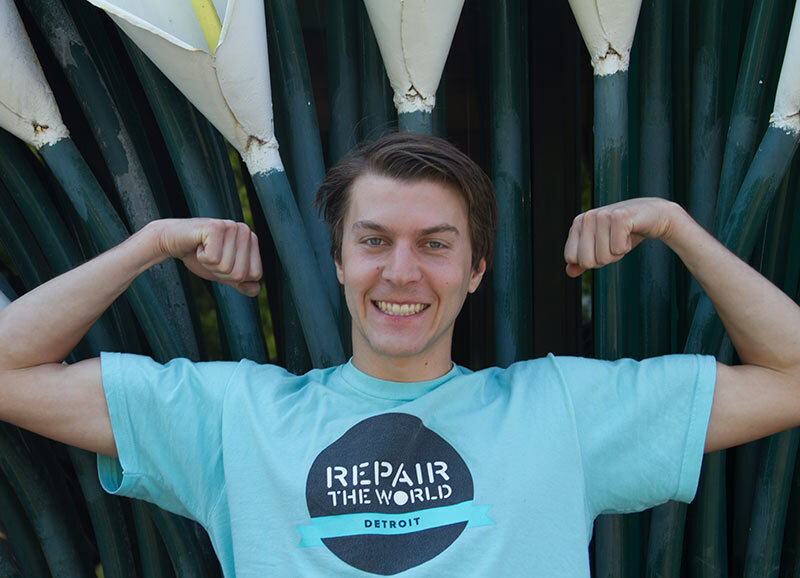 How has Repair the World Detroit changed you? AJ: I’ve learned the importance of creating mutually beneficial partnerships among different organizations – and how those partnerships can lead to a common goal – in our case meaningful, helpful and fun service experiences. COCO: I guess I’ve always been creative in one way or another, but if you asked me a year ago if I’d ever consider art as a career choice, I probably would have said ‘no.’ Among the many things we do, is work with children in a number of after-school enrichment programs and I was asked to take on the responsibility of arts and crafts. So I started gathering all these materials – paints, bubbles, paper – and every week my job was to come up with something for the kids to do. In the process, I started to focus and explore my own expressions with art and actually, since moving to Detroit, I’ve submitted pieces to two different galleries and my work has been accepted. I don’t believe I would have done that in any other environment – especially in the Bay Area, where it’s just assumed you have your own craft totally honed before you get into a show. JOEL: My strong suit is fun. Just put me on a skateboard flying downhill. It’s been a revelation to me working with kids. My girlfriend is a teacher and she’s also influenced the way I’ve worked with kids on a daily basis. I’m thinking of being a teacher, myself. I do feel like I’ve learned a lot these past months. But whatever I do, I’m going to have fun, no matter what. MICHAEL: I echo a lot of what already has been said about learning curves and entry points into the community. 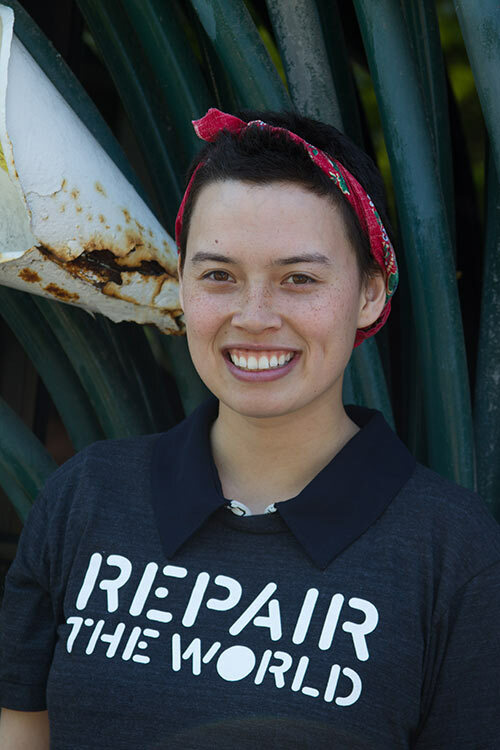 Working with Repair has helped me discover what I really like to do as well as what I don’t want to do at all, and that in itself is a step we all need to take. Fortunately, I’ve met people like Ben and Nora who have introduced me to people and places to go to. There’s so much happening here, a really fun city to be in with a lot of interesting things happening. CARLY: It also feels great to me to live in the city, feel safe and secure. Coming in as an outsider, taking part in a sensitive, thoughtful way, I have grown to feel that I am a part of this community and an ally to the people with the vision and passion to make a difference here. MICHAEL: For me, the biggest take-away from the experience has been getting to know the city of Detroit. I think Detroit is the most fascinating city in America. It’s a big city that still feels like a town, with the accompanying cast of characters. It’s a relationship town, a chutzpah town that rewards people who take risks. Being here has been endlessly interesting to me. CARLY: The great take-away for me is that you can learn from everyone — if you’re open to it. I believe we’re at a point in our lives where we can continue to feed our idealism. It seems to me that Detroit is a city where a lot of people are seeking alternatives — experimenting and succeeding in large and small ways. The opportunities here for learning are endless. And that’s what is so exciting to me. AJ: In all that I’ve learned in navigating the city, the experience also has revealed all that I don’t know about the city — there’s a very nuanced social, political climate and there’s a lot to grapple with and reflect on, and I think that I am in Detroit now to navigate my relationship to this place and stage in my life. I also reflect on what it means to grow up very close to the city, but have no relationship to it. Growing up here, I never visited, even as one of my parents got increasingly involved with institutions in the city, I was never brought down here. Now I wonder why and grapple with those questions. COCO: I’ve moved around a lot, but one of the things I’ve learned in Detroit is this: you want to be an artist, work hard do it. You want to start a business, work hard do it! In other places, the competition is unhealthy, you have to dominate to succeed. Here, competition is permissible, but it feels like a very honest, safe place to reach your goals. I’m pleased I’m here. AJ: A new job search. I hope to stay local, I have no plans to go elsewhere. JOEL: And did we mention? We’ll all be looking for our next job.